It was another beautiful day in San Sebastian on Tuesday July 10th. After our classes, Professor Zabalbeascoa walked us, well, some of us ran, up the Monte Urgull mountain, where one of the most well known tourist attractions lie. 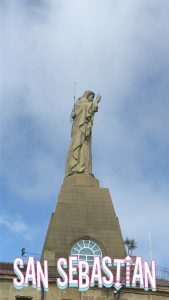 The famous Jesus statue at the top of the mountain sits at the heart of the Basque city of San Sebastián, Spain. Walking up the mountain was a breathtaking experience. Overlooking the harbor and the beach (Playa de La Concha) was a view that I’m sure many of us have never experienced before. San Sebastián is known to have a rich history and walking up the mountain has allowed us to witness some of the beautiful architecture that has been maintained from the civil war. A few noticeable points along the walk were the different paths that people took to get up the mountain. Some paths were faster than others, which I believe heightens the walk because everyone can have a different experience. Even if we wanted to walk up it again, we would have a different experience and view from before. I also was impressed that half way up the mountain there is an outdoor seating area and a bar that allows people to take a break, relax, and have a more enjoyable experience. When we reached the top area, there was a museum-like entrance that allowed people to learn about the history of the statue as well as the history of Spain and San Sebastián. However, when we reached the very top of the statue, there were very few words to express our thoughts. Instead, we mostly just took in the amazing view and captured those moments with pictures. After taking several group photos, we began our descent and found a nice spot with a gorgeous view to hold our class discussion about San Sebastián’s history and an analysis on the book “The Sun Also Rises”, by the famous author, Earnest Hemingway. We discussed how and why Hemingway portrays the main character, Jake, the way he does. 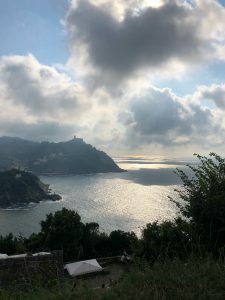 What really brought the book together for me in relation to our trip was how Jake felt visiting La Playa de La Concha after participating in the famous Running of the Bulls in Pamplona, which is another part of Spain just over an hour away from San Sebastián. It has always been common for people to take a bus or drive over to San Sebastián after running from death. This week especially is most significant because The Running of the Bulls only takes place once a year, and this year it happened to fall on the exact week that we are visiting. Moving back to the story, laying on the beach for Jake, he felt a completely new state of inner peace because all throughout the book, he had been struggling with an inner conflict with himself. I believe that the reason his mindset had changed in the book was because he had just seen death in the face with Romero and now he feels at ease, or at least much calmer. Only being here for four days now, I personally feel more at peace here learning about the Spanish and Basque culture along with the Spanish language, than if I was studying it back at home. Laying on the beach, watching the beautiful teal waves during the day and meeting so many new people from all over the world at night has given me an entirely new perspective on the world. Thus, when Hemingway talks about Jake visiting San Sebastián and how it made him feel, I feel like I can personally relate to him. 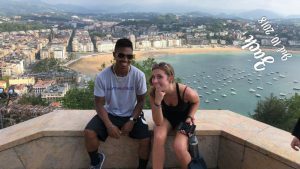 Even though we still have class in the summer, learning about San Sebastián and its vast history has been an incredible experience for me so far, and we still have a full two and a half weeks left to explore learn. I have no problem sitting and listening for over an hour about the Spanish culture here because it doesn’t even feel like I am in class, but rather just having fun, having new experiences with great people, and learning about the culture. Once our class time has ended, around 8 o’clock, we started to descend all the way back down the mountain for some final glimpse of the wonderful views on the mountain. So far, I have made lasting memories and have had a journey that I will never forget. Walking down the mountain with my friends was very fun for me and very peaceful.